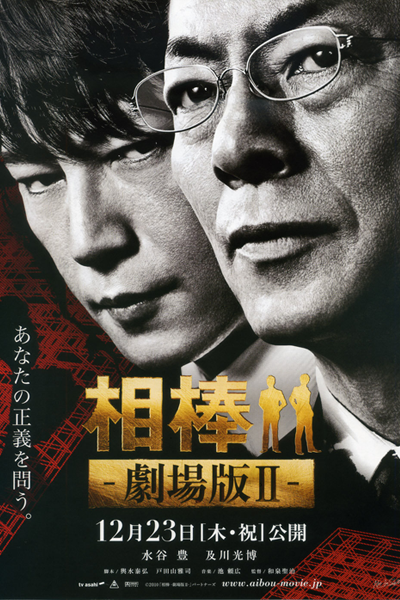 At the Metropolitan Police Department (MPD) Headquarters, the core of the Japanese Police, an unprecedented hostage situation in the history of MPD breaks out. The hostages are 12 top executives of the MPD: Superintendent-General Tamaru, Deputy Supt-Gen Hasegawa and bureau chiefs. The conference room, where the perpetrator and the executives are held hostage, is completely surrounded by Riot Police Squad and Special Investigation Team (SIT). The perpetrator’s motives are unknown and he makes no demands. Meanwhile, two gunshots echo from the conference room. Ignoring Sugishita’s strong opposition, Nakazono orders Riot Squad and SIT to storm the conference room. What they find there is Yaegashi, shot and dead. Gunpowder residue is found on all the hostages, but who fired the gun? This cannot be determined. While released from captivity, all 12 hostages become suspects. In response to Supervisor Okouchi’s questioning, all the hostages give ambivalent testimonies that the gun went off while they struggled to neutralize the perpetrator, and that they do not know who pulled the trigger. Concerning Yaegashi’s demands, all remain silent. Becoming strongly suspicious of this, Sugishita and Kanbe gains cooperation of Chief Kakuta and others, and undertake their own question of the executives, who were taken hostage. On the other hand, receiving the report of the hostage case, National Police Agency Director Onoda, along with National Police Agency Commissioner Kaneko, begins to make disturbing moves.